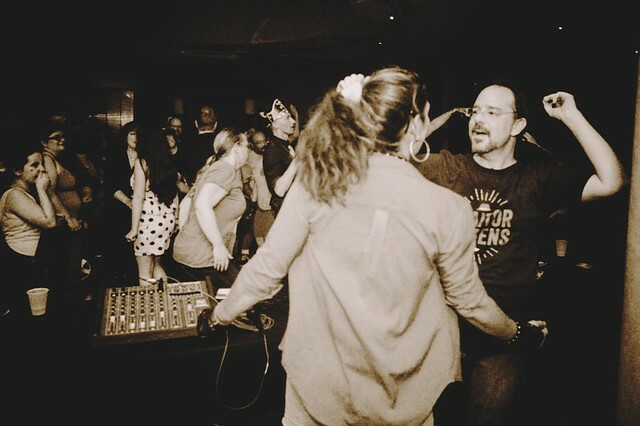 Me and the wife at the Detcon 1 80s Dance Party, at which I was DJ. Photo by Al Bogdan. I spent the weekend at Detcon 1, the North American Science Fiction Convention, held this year in Detroit, and had a pretty fabulous time. The convention was held at the Renaissance Center in downtown Detroit, and it was the first time I’ve been downtown Detroit for a couple of decades. Those hoping for a report on a blighted hellscape will be disappointed — we walked around downtown quite a bit and it was was perfectly fine; a decent number of restaurants and shops and such, with the extra added benefit of Canada on the other side of the water. I’d be happy to visit again soon. I kept myself busy at Detcon 1 with several panels and events. All of my panels were good ones, which is a happy thing, since that’s not always a guarantee. But every panel had a good mix of smart panelists and engaged audiences, so I came away from each feeling pretty good about them. I also had an excellent reading, in which I was paired up with Jacqueline Carey. What she writes and what I write are sufficiently disparate that we both worked on the assumption it would be a fine time to introduce ourselves to at least some portion of the audience. It worked out pretty well, or at least, the audience didn’t divide into two camps and decide to have a knife fight. So we had that going for us. My big event without question, however, was the 80s Dance Party on Saturday, for which I was the DJ. I had DJ’ed a dance party at a science fiction convention before — at Capricon, a couple of years ago — and on the basis of that I was asked to host a dance here. I overprepared just a bit, in that I had a playlist of 23 hours worth of music for a three hour dance, but it worked out well for me in that I had a lot of options for when the actual dance. The dance took place in a pretty ideal space (the 42 North lounge at the Marriot hotel) and the convention threw in a laser light show for free, so if I screwed it I couldn’t blame the location. Fortunately, it does not appear that I screwed it up. The dance floor was full for the very first song (Prince’s “Let’s Go Crazy”) and it was full for the last song (“Smells Like Teen Spirit,” because it was the song which officially closed the door on 80s music), and it was full for all the songs inbetween — which is, to my mind, is the relevant standard for a successful dance party. I also hopped about like a madman for three hours straight, occasionally going out on the dance floor myself, and at least once getting up on a chair to pump up the crowd. It was a ton of fun, but man, am I feeling it today. Worth it, though. And I got offers to DJ other convention dance parties, so if this whole writing thing falls through one day, it’s nice to know I have a backup skill. The only downside to Detcon was that on the way home I seem to have been hit with a case of sudden onset con crud and ended up crashing out in the back bench of the minivan for most of the ride home. I’m still fairly out of it; I suspect tomorrow will largely be spent sleeping and staring glassily into the TV. Again, worth it for such a fine weekend. I would do it again.